I apologize if I am not communicating well. I can’t tie this. I have no idea what I am doing. Never heard of this pattern before and I didn't find an image on Google. Based on the recipe, I think it would look something similar to this. 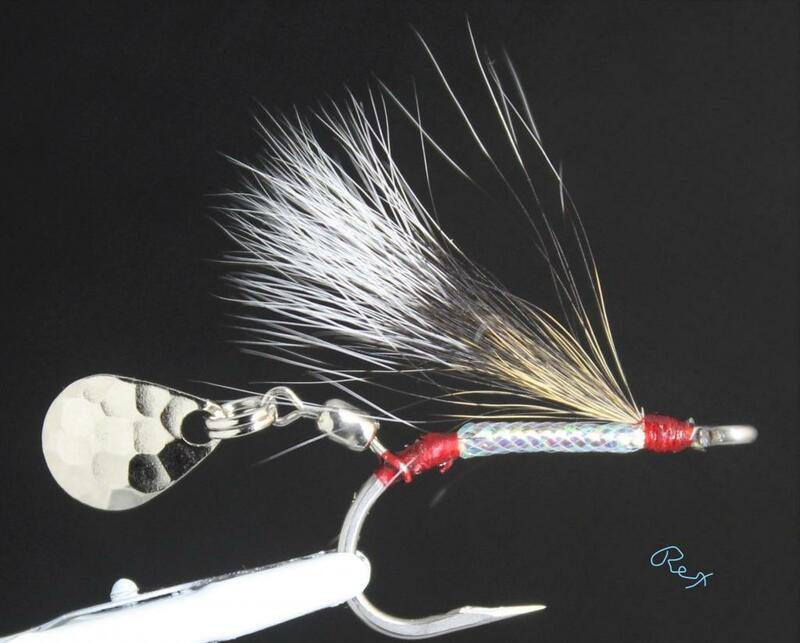 Note: I used a silver salwater hook (because it was the first sz 4 I found), I used pearl mylar (because I don't have clue where my silver is hiding), and the blade is a size 0, not 00 (because I already had it attached and ready to tie on to a fly). If I were to retie this one, I'd push the spinner a little lower on the bend so that it is more in line with the shank and add more mylar. The trade off is the risk of affecting the gap and maybe impacting hookups. Personally, I'm not impressed with this fly. I think there are better spinner fly patterns than this one, but your mileage may vary. As a side note, if you are trying to find information on tying flies with spinner blades, you will find very few people that use them or know anything about tying with them, and you will will find that some people do not approve of their use. The majority of the time when I ask for help with tying bass flys or bait fish flys the response I get is, just learn to tie the smaller one. This would be like some one asking for help with conventional bass tackle and telling them to stay with a road runner or beetle spin. I have four boxes of smaller flies. I don’t need the smaller flies. Fly fishing and tying for bass is still a niche part of the fly fishing community. Not all fly fishing sites/boards are "bass friendly". Even this site hasn't always welcomed bass fly discussions. Fortunately, there are a lot of opportunities to learn fly tying in the DFW area. The "Red River Rendezvous" was just a couple of weeks ago. There were somewhere in the neighborhood of 30 tyers that could have answer pretty much any question you had about tying, materials, or patterns. This weekend is "Fly Fish Texas" in Athens. There will be a couple of dozen fly tyers available to help anyone and there will be formal fly tying classes. The "Texas Fly Fishing and Brew Festival" the weekend of March 23 in Plano, with have several nationally known fly tyers along with another 50 fly tyers that will be tying continuously throughout the event. Someone at this event should be able to answer your questions. On a regular basis, the Red River Fly Fishers tie the second Tuesday of each month in Sherman. On Feb 12, they will be tying the "Slumpbuster" pattern. All you have to do is bring your vise and tools and show up to learn that pattern. Every Wednesday, at the Bass Pro in Grapevine, they do something similar where they teach a different pattern each week. Again just show up with your tools. Every Saturday at the same Bass Pro, they have fly tying. On Saturday, everyone ties whatever they want tie, but there are people that will help you learn pretty much whatever. The Allen Cabela's has 3 or 4 people tying each Wed evening and Sat morning. They are happy to help anyone learn and you can usually get one on one lessons. (Note, this coming weekend most fly tyers will be in Athens and not at Cabela's or Bass Pro.) Also, many of the area Orvis shops have fly tying classes on Saturday mornings too. With all of that said, whether you are tying a large fly or a small fly, learning good technique is what is important while getting help. If you know good techniques, then you will be able to tie almost anything. One last comment, many "saltwater" flies, work extremely well as "bass" flies. Mr. Rex, you are awesome as always. I went by Eisenhower on Sunday of the RRR while coming back from Camp Simpson with Troop 605, but i guess they had already packed up because no one was there at 10:00 AM. I will try to start visiting the second Tuesday of the month again. I gave a tote of fly tying supplies. Humorously, my wife and I actually started looking saltwater flys books this morning. Ps, I have visited multiple groups that you listed above about tying bass flys. Just an FWI. Your comments paralleled my experances. 80-90% of the fly fishing material out there is for trout fishing. Thank you for helping me stay positive. Dr Crappie, you are awesome and thank you. If you went on Sunday, you missed it. It is a Friday evening through Saturday event. Try to get over to Athens Saturday morning. That's a very family-friendly event and the ponds are heavily stocked with trout. Good thread. Scout, if you can figure out all that reloading stuff like you talked about, fly tying should be a breeze. 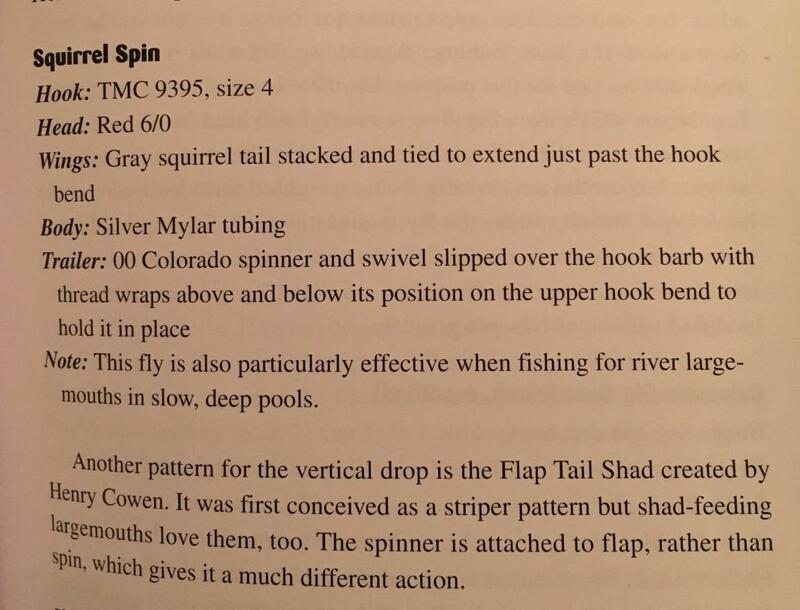 I’m not a fly tying book lover. I rather like tying videos, at least some of them. It was much easier for me getting a pattern down to see it being done then doing it for myself than reading about it with a picture or three and then trying to work out just how it got done. I start and pause videos to learn a tougher step. These days with more experience under my belt, I can often reverse engineer a fly from a photo or two and then tie it, but that takes time tying and experience. Here’s one. Steve potter doing a dahlberg diver. Spinning deer hair sounds intimidating, but it really isn’t once you get a little time doing it. The good thing about spinning these is that if they aren’t so tightly packed, they work. If they aren’t trimmed perfectly, they work. If your color patterns look unlike his, they still work. If you don’t stack your hair in a stacker, they work, I don’t even own a deer hair stacker. If you don’t comb out the under hair, they still work, deer hair will still spin and the fly will still catch fish. If you don’t have the fancy glue on eyes, no problem, I never use the eyes on divers and they still catch fish. Trim off too much deer hair and it doesn’t float, you basically made a muddler minnow, a great bass pattern in its own right. Spinning deer belly or body hair works into a lot of patterns, not all surface ones, either. You can do a number of flies with a little patch of hair. My deer hair divers are just a marabou tail, four barred, dyed grizzly rooster neck hackles, two per side, and a trimmed and variably packed spun deer hair head. In the salt, the same deer hair goes into making a borski slider, a subsurface fly. Really, there’s some basic things going on with lots of patterns fresh or saltwater. Tying in a tail of something is one basic thing using craft fur, rabbit zonker, marabou, or whatever. Gazillions of streamers flies have tied in tails. Lots of flies have hackle tied in and wrapped, otherwise known as to palmer, forward. It’s a basic way to do a bunch of things and only the type of hackle and size might really vary pattern to pattern. Another way to put on material is to dub it on. There are pre-made brushes for purchase or you can make a dubbing loop and then make your own brush right on the fly. Sometimes, people just put a little dubbing material right on the tying thread and then wrap forward. Know and get comfortable with these basics and it will likely benefit you in many of the flies you might want to try in the future. There’s a lot of good advice in this thread, but I’ll pitch in my $.02. A lot of flies are designed to catch fishermen rather than fish. There is much to be said for mastering the basics. Tying the woolly bugger, the clouser, and a deer hair popper isn’t hard but mastering them can take a lifetime and the skills you learn perfecting them translate to a lot of other flies. Don’t get too caught up in the next great thing, learn and practice the fundamentals and you’ll be a great tier in no time. To all who responded... THANK YOU!! Mr. Rex, thank you for the information. However, this weekend I will be at Camp Wisdom in Dallas teaching Scout Classes. It the opertunity is available, I wil be assisting a scout with his fly fishing merit badge as well. His last objective is to catch a fish and he will complete the merit badge. I think a woolly bugger is in order. I got my start at BassPro in Garland. Went to a free class, fished the ponds in front of the store etc. Then I bought a Bass kit. DVD, materials and tools. None of the ones that I have tied out of that series has let me down. I was in there the other day and noticed they now carry just the dvd. Might be worth a look. From there, I've ventured into other creative flys. Goldfish for Purtis Creek, poor mans Sweeny Todd etc.